Bartek's coding blog: How to get File Size in C++? How to get File Size in C++? Before C++17 we could often complain that even simple tasks as getting a file size were complicated. With std::filesystem things get a bit easier! STL before C++17 didn’t contain any direct facilities to work with a filesystem. We could only use third party libraries (like Boost), or system APIs. To get file size, a popular technique was to open a file and then use file position pointer to compute the size. I haven't explored all of the possible options, so let ma know what is your way of getting file size. How about C++17? Is there any chance to have a simpler code and maybe portable? 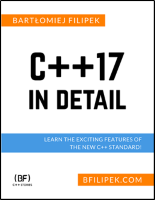 C++17 brings std::filesystem which streamlines a lot of tasks on files and directories. Not only you can quickly get file size, its attributes, but also create new directories, iterate through files, work with path objects. The first function is a free function in std::filesystem, the second one is a method in directory_entry. Each method also has an overload, as it can throw an exception or return an error code (through an output parameter). std::cout << "error when accessing test file, size is: "
You may ask why do we have two methods - as a free function and as a method. The reason is that directory_entry caches file attributes. That’s why if you iterate over a directory, or you access file several times, then caching might bring performance improvements. If the file or the directory pointed by directory_entry changes then you need to call the directory_entry::refresh() method to update the cache, otherwise you might get "old" values for your queries. (Here’s also a code at Coliru). In this short post, you’ve seen how to use file_size function from std::filesystem. 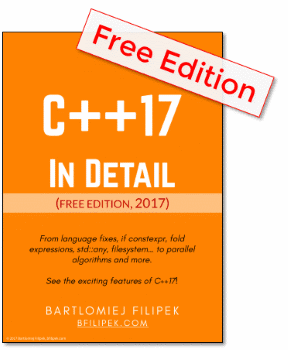 I encourage you to explore this new and powerful addition to C++17. If you work with files and directories, this might make your code much more comfortable and portable.